Oregon is the state with the most ghost towns. Mary Freeman writes garden mysteries from Oregon. Very interesting – I’ve not stumbled across any of these series before! Another to add to the list is the Claire Montrose series by April Henry, which take place mostly in Portland, Oregon, although in one of them (can’t remember which) Claire spends some time in New York City, but it’s just a short business trip. As a Portland resident I found them quite interesting when the author mentions places I’m familiar with and historical bits about the city. Thank you, Sunny, for telling us about April Henry. Also, I don’t know why I inter-changed those letters! 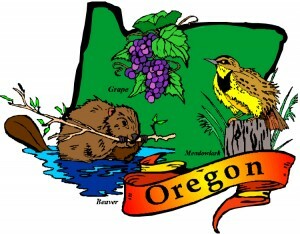 Just to clarify, must be a typo … SALEM (not Selma) is the Oregon State Capital. Love this site, and this page in particular, thanks for all the hard work! Thank you, R Gould… Definitely a typo… but at least I got the correct letters! Linda, that’s exactly how I feel about the British Cozy Mysteries AND the New England Cozies. I must mention the most excellent legal thrillers by Kate Wilhelm, the Barbara Holloway series. “Bobby” is a defense lawyer working in Eugene, OR. Her father, a retired lawyer [whom I invariably see portrayed by venerable actor John Mahoney], helps her in an advisory capacity and keeps her sane. Read the books in order, because the backstories change as life progresses for Barbara and her devoted fellow lawyers. The books have emotional resonance. Caring too much is what Barbara Holloway does best! Thanks, Marja, for telling us about Kate Wilhelm’s Oregonian thrillers! Just read my first Kate Wilhelm mystery , ” A Wrongful Death.” This was a very good story, one that I couldn’t put down. Can’t hardly wait to get to the library to get more from this author. Sorry, with this economy the local libraries are all I can afford. But I love the stories about Oregon. The writer is bang on! What wonderful books. Highly recommended! I’m really enjoying all of the lists, thanks! I love the Jane Kelly series that is set in Oregon, but am bummed that there are only three and the last one came out years ago. The author’s website says a new one is in the works, Pink something or other. I hope that does come to pass. Thanks, Lyssa, for telling us about the “whereabouts” of Nancy Bush. I just took a look at her website and see that the “working title” of her next Jane Kelly mystery is Pink Cadillac. If you think about it, please let me know when it is released… Thanks! I love the books that are set in Oregon, Washington State, Arizona, Colorado, Maine, places that I know I will never see. I sort of like the books with Michigan as the place setting but being a dyehard Buckeye, I tend to pass some of these!! MK Wren has a great series set on the Oregon coast. Her detective hero of native American heritage is Conan Flagg. Wish she’d write some more of them! Thanks, Melissa, for telling us about M. K. Wren’s Conan Flagg Mystery Series. Thank you, Kathleen, for telling us about your home decorating theme mystery book Hammered, Nailed and Screwed. Thanks, Katty, for telling us about Kendra Elliot’s A Bone to Pick mysteries. Welcome to the Cozy Mystery site, Katty! I’m glad to hear you’ll be back often. Thank you for some new authors for me to try. I also love LJ Sellers (Eugene, OR setting) and Kendra Elliot mentioned by another blogger. Rondie, thanks for telling us about Kendra Elliot and L.J. Sellers! Neva, thank you for telling us about M.K. Wren’s books. Emily, thanks for the suggestion! I’ll have to take a look at that some time. Clover Tate is the pseudonym of Angela Sanders who also writes the Joanna Hayworth mysteries set in a vintage clothing store in Portland. Her stories are great fun. I am looking for fictional mysteries set on the Oregon Coast. I read one not too long ago about a fictional murder on Cape Kiwanda, and I read a couple by Patsy somebody about a quilting club that solved mysteries, and another one where a girl’s body was found on the beach. I ran across these by accident and darned if I can’t remember the authors. Just want exciting fictional stories about living in a small Oregon coastal towns, crabbers, fishers, bookstores, cafes – suggestions please?